The Northern Ontario School of Medicine (NOSM) is committed to engaging Northerners in the education process. The publications and reports listed below assist in this objective by updating readers on important events and activities concerning NOSM and its partners. 2014 – We couldn’t do it without you | Nous n’en serions pas là sans vous. Northern Passages, is a quarterly publication which conveys news about the School’s multi-faceted activities. 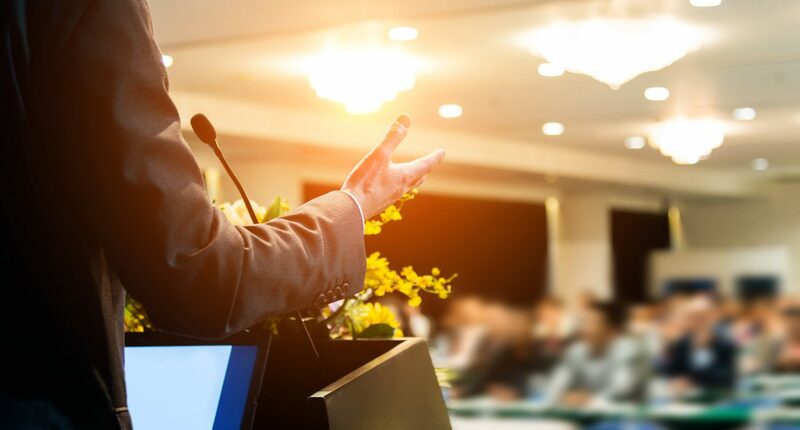 Its broad coverage informs and entertains with detailed commentary on program development, conferences, profiles, and other information germane to the School and its Northern stakeholders. Distribution includes governmental bodies, health-care centres, NOSM faculty, our various community partners across the North, including Indigenous and Francophone communities. 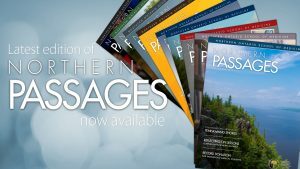 Northern Passages is available online in PDF format. Scope can be defined as: the range of one’s perceptions, thoughts, or actions; the geographical or perceived area covered by a given activity; or, a viewing instrument such as a microscope or telescope. In most modern usages of the word scope, there is a unifying theme of examination or investigation. In this case, Scope includes all of these ideas. Research at the Northern Ontario School of Medicine (NOSM) is reflective of the School’s mandate to be socially accountable to the diversity of Northern Ontario. As such, studies are being undertaken in a range of subjects including culturally appropriate care for Indigenous peoples, new drug technologies, cancer screening methods, patient rehabilitation, lake water quality, and so much more. Subjects being studied are as varied as the geographic area of NOSM’s wider campus of Northern Ontario and as diverse as the researchers themselves: faculty members in the School’s Human, Medical, and Clinical Sciences Divisions, residents, medical students, a broad range of health-professional learners, and collaborators. 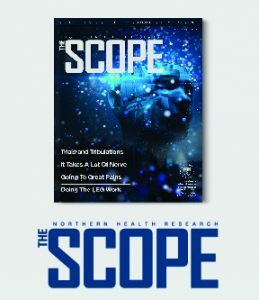 Although this publication cannot provide the full scope of exciting research happening across Northern Ontario, we hope it provides a glimpse into some of the work being done with a view of improving the health of Northern Ontarians and beyond. The Northern Ontario School of Medicine (NOSM) welcomed delegates from Indigenous communities of Northern Ontario to the Indigenous Research Gathering 2016 in the territory of the Anishinabek (Ojibway) Peoples of Baawaating and where the Métis have resided. The two-day Gathering, hosted June 22 – 24, 2016 and preceded by an afternoon and evening of ceremony and reflection, provided many opportunities for the delegates, invited guests, and organizers to interact and talk about how research can be better incorporated and be more meaningful for the communities of Northern Ontario. From September 19-20, 2018, Wauzhushk Onigum Nation welcomed us again for NOSM’s fifth Indigenous Community Partnership Gathering, Gathering Together for Life and Well-Being. Unfolding over two days, through ceremony, shared meals and conversation, the Gathering brought together more than one hundred Indigenous Elders, leaders and community members, creating a space for people to speak openly, and for difficult questions and issues to be heard and discussed. Develop, strengthen, and enhance relationships. Provide information regarding past recommendations made to NOSM at the last gathering May 2011. Report about the tangible progress NOSM has made in implementing those recommendations. Seek recommendations about how the School can refine its practices, activities, and outcomes to ensure that NOSM continues to meet the needs of Aboriginal peoples across Northern Ontario. NOSM and the Métis Nation of Ontario (MNO) co-hosted an Indigenous Workshop entitled “Living the Vision” on May 25 – 27, 2011 in Sudbury, Ontario. This workshop, NOSM’s third Indigenous gathering, is a follow-up to the “Follow Your Dreams” workshop held in Wauzhushk Onigum in June 2003 and the “Keeping the Vision” workshop held at Fort William First Nation in August of 2006. The purpose of the workshop was to inform Indigenous peoples of the progress made by the School on recommendations received during the previous two Indigenous workshops and to provide a forum for continuing dialogue between Indigenous peoples and NOSM. The MNO and NOSM have a range of common goals; both are actively involved and engaged with serving their communities and have, as a part of their mandates, a focus on reflecting the needs of the communities they serve. As such, there is a solid basis for mutually beneficial collaboration. Following the opening of the workshop, the MNO and the School officially announced and signed a historic Collaboration Agreement. Indigenous community and health-care leaders from across Northern Ontario spent three days engaged in discussions at a workshop hosted by the Northern Ontario School of Medicine. The “Mii Kwen Daan – Continuing the Dialogue” workshop, held at Fort William First Nation, provided a forum for participants to discuss opportunities to further engage Indigenous communities into the ongoing development of the School. Communications: Evaluate the mechanisms used to communicate with Aboriginal communities to maximize their impact and effectiveness. Community Engagement: Provide further opportunities for students and community staff to interact and learn from each other to prepare them for community and cultural learning experiences. Admissions: Advocate for greater financial support for Aboriginal medical students and applicants. Curriculum: Develop additional opportunities to increase and sustain cultural awareness. Research: Establish an Ethics Review sub-committee of the Aboriginal Reference Group. In June of 2003, NOSM hosted its first Indigenous Partnership Gathering in the Anishnaabeg community of Wauzhushk Onigum First Nation, near Kenora. The three-day gathering brought together over 130 delegates from Indigenous communities across the North. The report from this first Gathering served as a blueprint for the establishment of the Indigenous Affairs Unit and the Indigenous Reference Group, as well as the development of partnerships with Indigenous communities so that all NOSM medical students have a mandatory four-week cultural immersion experience in their first year. Please visit NOSM’s Research homepage for more information on NOSM Research reports and publications. Research in Focus on Research is a publication series which synthesizes and summarizes studies conducted by CRaNHR researchers.